Hey guys, check out our newest commercial promoting heath and wellness through our 4-Mile Hill Challenge event! Share with your friends, family, and anyone you'd like to spread to word. Visit: www.4MileHillChallenge.com for more info. Special thanks to Who's Next Boxing Academy for hosting the location for the promo video! Check out their Facebook, and their Yelp! Welcome to our AAF new site! We have a new website coming! 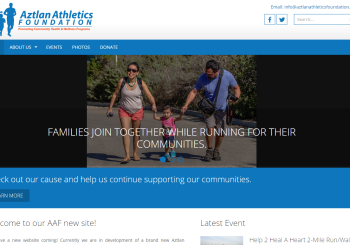 Currently we are in development of a brand new Aztlan Athletics Foundation (AAF) website. Here you'll be able to learn and discover more about our cause and purpose for our communities. Stay tuned for updates!